Tomorrow, Tuesday April 16, I will be one of four presenters at the Ocean Users' Group meeting. 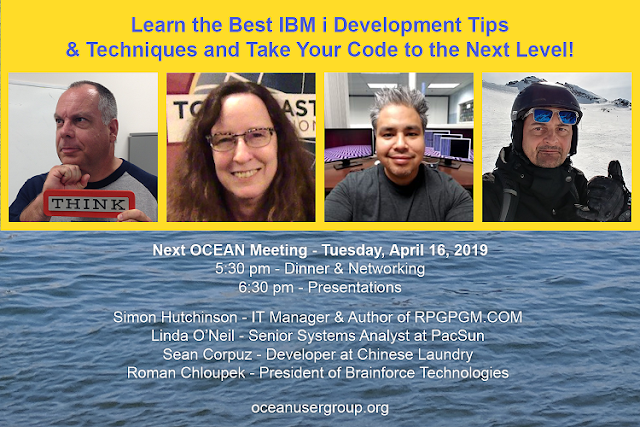 This is the first time I will be presenting to an IBM i user group, and I am looking forward to it. If you can attend the event is at the National University in Costa Mesa. Dinner is at 5:30 PM, with the presentations starting at 6:30 PM. If you cannot attend the event will be live streamed, details on Ocean's web site (link below). I hope I will see many of you there.